This Recreational and Private Pilot app can prepare you for any or all of the following FAA Knowledge (written) tests. Inside the app, you can select the specific test from the list below that you want to study for, and the app will then filter the questions to only those that apply to that test so that you don't study extra or unnecessary material. This Instrument Rating app can prepare you for any or all of the following FAA Knowledge (written) tests. Inside the app, you can select the specific test from the list below that you want to study for, and the app will then filter the questions to only those that apply to that test so that you don't study extra or unnecessary material. 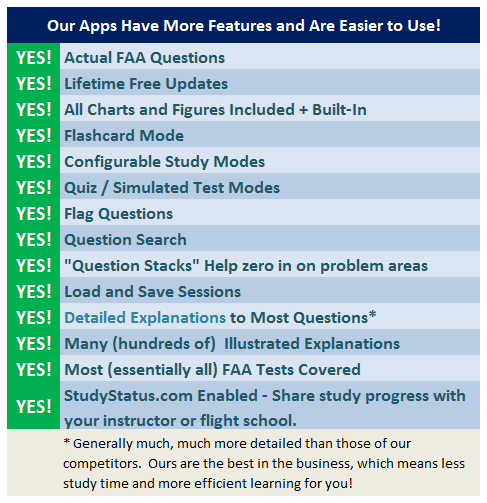 This Commercial Pilot app can prepare you for any or all of the following FAA Knowledge (written) tests. Inside the app, you can select the specific test from the list below that you want to study for, and the app will then filter the questions to only those that apply to that test so that you don't study extra or unnecessary material. This Flight and Ground Instructor app can prepare you for any or all of the following FAA Knowledge (written) tests. Inside the app, you can select the specific test from the list below that you want to study for, and the app will then filter the questions to only those that apply to that test so that you don't study extra or unnecessary material. This Airline Transport Pilot app can prepare you for any or all of the following FAA Knowledge (written) tests. Inside the app, you can select the specific test from the list below that you want to study for, and the app will then filter the questions to only those that apply to that test so that you don't study extra or unnecessary material. This Flight Engineer app can prepare you for any or all of the following FAA Knowledge (written) tests. Inside the app, you can select the specific test from the list below that you want to study for, and the app will then filter the questions to only those that apply to that test so that you don't study extra or unnecessary material. 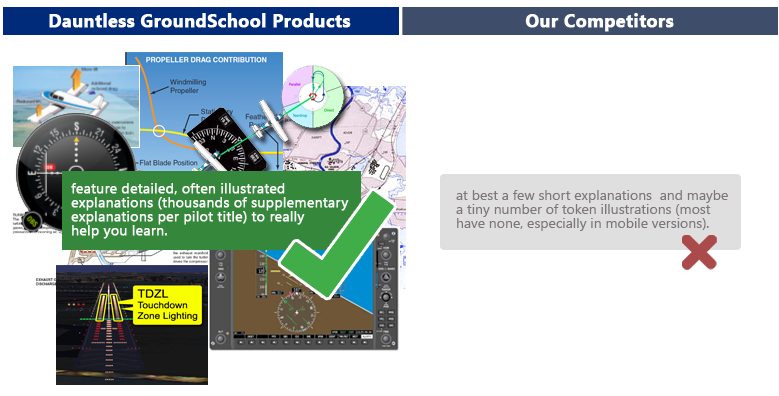 This Sport Pilot - General app can prepare you for any or all of the following FAA Knowledge (written) tests. Inside the app, you can select the specific test from the list below that you want to study for, and the app will then filter the questions to only those that apply to that test so that you don't study extra or unnecessary material. This Sport Pilot - Instructor and Examiner app can prepare you for any or all of the following FAA Knowledge (written) tests. Inside the app, you can select the specific test from the list below that you want to study for, and the app will then filter the questions to only those that apply to that test so that you don't study extra or unnecessary material. This Aviation Mechanic - General app can prepare you for any or all of the following FAA Knowledge (written) tests. Inside the app, you can select the specific test from the list below that you want to study for, and the app will then filter the questions to only those that apply to that test so that you don't study extra or unnecessary material. This Aviation Mechanic - Airframe app can prepare you for any or all of the following FAA Knowledge (written) test. Inside the app, you can select the specific test from the list below that you want to study for, and the app will then filter the questions to only those that apply to that test so that you don't study extra or unnecessary material. This Aviation Mechanic - Powerplant app can prepare you for any or all of the following FAA Knowledge (written) test. Inside the app, you can select the specific test from the list below that you want to study for, and the app will then filter the questions to only those that apply to that test so that you don't study extra or unnecessary material. This Parachute Rigger app can prepare you for any or all of the following FAA Knowledge (written) tests. Inside the app, you can select the specific test from the list below that you want to study for, and the app will then filter the questions to only those that apply to that test so that you don't study extra or unnecessary material. This Remote / Drone Pilot app can prepare you for any or all of the following FAA Knowledge (written) tests. Inside the app, you can select the specific test from the list below that you want to study for, and the app will then filter the questions to only those that apply to that test so that you don't study extra or unnecessary material. Looking for "US Military to FAA Civilian Pilot/Instructor Experience Conversion" Military Competence Test Prep for Android™? Click here. 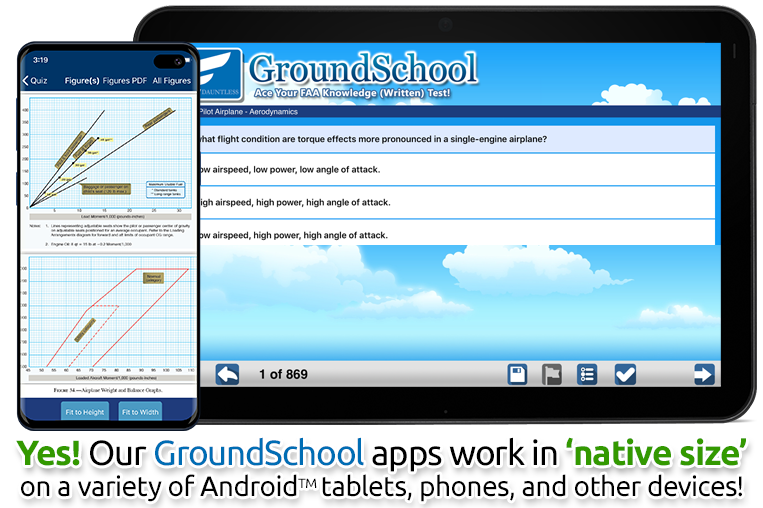 GroundSchool for Android is now available! Learn more or purchase them from the Android App Market / Google Play / the Amazon App Market by clicking one of the links above. We'd love to be able to offer this. Unfortunately, the Android™ apps must be purchased via the Google Play / the Android App Marketplace and the Google App Marktplace policy does not allow us to reliably co-mingle promotions like this. (In fact, when you order the app, we don't even know that you are one of our customers). Here's the really cool thing - the Android™ apps feature a built-in update mechanism. What this means is that with just a few clicks, our app will check the internet for updated data and download them to your device as necessary. This is integrated, fast, and free for those who have purchased the app. That also said, we tend to update the 'build packages' for our apps often, so chances are that your data is up to date the moment you download it from Google Play / the App Marketplace, even if you don't use the built-in update right away. No, you don't! Once an app is installed on your device (after you purchase it from Google Play / the Android App Marketplace), you don't need to be actively connect it to use it. This means, for example, that you can spend your time in a passenger seat of an automobile or aircraft studying even when you don't have an active internet connection. Of course, you need to have an internet connection to your device to get updates from our servers from time to time, but as far as everyday use goes, you certainly do NOT have to be connected to the Internet. Pursuant to the terms of the Google Play / App Market EULA, this is a LIFETIME PERSONAL LICENSE to ues the app. In other words, it doesn't expire! It will be waiting for you when you need this. Compare this to our competitor whose more expensive product has very short expiration dates, forcing you to pay extortionate continuation fees if you want to keep studying before a test or review later on.